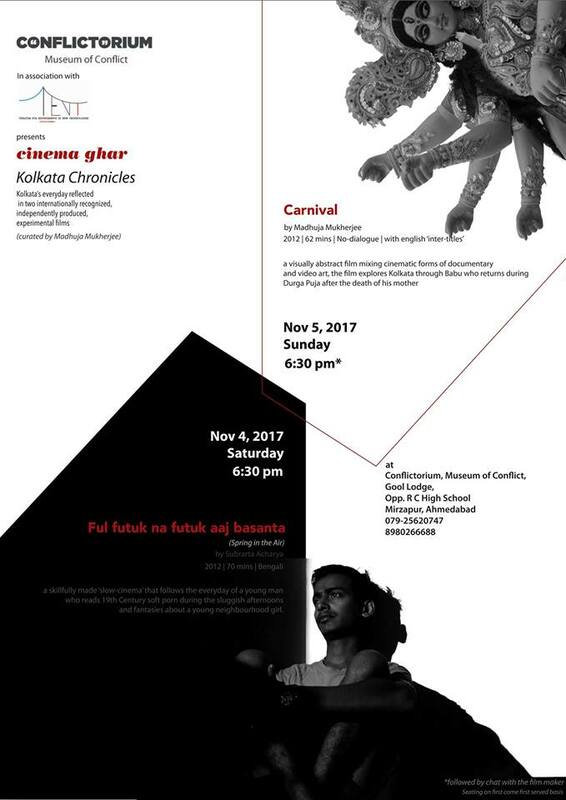 Cinema Ghar is back with two internationally recognized, independently produced, experimental feature-films, which explore and reflect on Calcutta/Kolkata’s everyday, and radically challenge both established film-forms and ideas about the city. This session of Cinema Ghar: Kolkata Chronicles is curated by Madhuja Mukherjee who will also help facilitate a discussion. Spring in the Air (2012, 70 mins, Bengali) by Subrarta Acharya: This lyrical story of Bonobashi a girl who lives in Kolkata, evokes the tale about the princess locked in a castle chamber. After moving into a poor quarter, the attractive young woman becomes a magnet for the attentions of every local man and boy. But since her arrival she has yet to leave the apartment to walk out onto a street full of curious adolescents. She shares the apartment with an eccentric old man, probably her father, who controls her contact with the outside world. One of those interested in her is Bishu, a young, frail man who wanders the streets of the neighborhood. The film creates a poetic impression of the closed world of the poor district and its isolated inhabitants. Using simple and captivating means, it reveals a network of boisterous emotions that it invests with internal magic and mystery. The director’s distinctive vision is underscored by effective black-and-white camerawork that picks up the subtle nuances of world reeling under desire, violence, loneliness. Carnival (2012, 62 mins by Madhuja Mukherjee): The thin plot line of the film involves ‘Babu’ who has returned to Kolkata from somewhere during the Hindu festival (Durga Puja), following the death of the ‘mother’. At home he is struck by father’s obtuse state, which is counter-balanced by his experiences of the city and excessive celebrations. In the end, Babu hopes to escape this milieu, death and ecstasy, but his story is swallowed by the cinematic-form and mindless merriment. Carnival mixes many forms, including elements of documentary and personal cinema, video-art and documentary. Madhuja Mukherjee teaches in the Department of Film Studies, Jadavpur University, Kolkata. She has published research papers in scholarly journals, and is the author of the book ‘New Theatres Ltd.’ (2009), editor of ‘Aural Films, Oral Cultures’ (2012), ‘Voices of the Talking Stars’ (2017), and [co-editor] of ‘Popular Cinema in Bengal’ (forthcoming). She is also a filmmaker (Carnival, 2012) and writer (Qissa, Anup Singh, 2013); and a practicing artist.